Embellished with dried flowers and leaves, this handmade paper photo frame is perfect to frame ones favorite pictures. We offer a huge assortment of Handmade Paper Photo Frames in different intricate designs on the borders, and is perfect to suit the luxurious home decor. Our photo frames coordinate well with any type of interior decor and are available in various standard and customized shapes and designs. picture frames are perfect gifts : they're personal, quickly customized and come in a variety of styles. Show that memorable picture to everyone prominently displayed in your lobby, room or office with the help of these exquisitely handcrafted handmade paper photo frames. available in a variety of sizes as per your requirement, say something with your frames: this is a great picture. 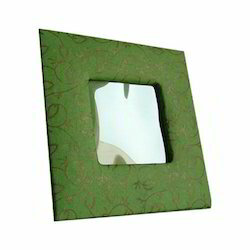 Hold the memorable moments in our range of photo frames. 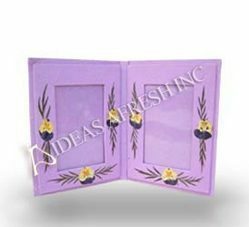 We have designed and developed exquisitely designed photo frames in attractive colors and designs.